Heat up the sesame and olive oil in a non stick pan . Add in garlic and saute till fragrant, add in all the mushrooms , zucchini and the large onion rings and stir fry till soft. Add in the cooked organic mee and continue to stir fry till well mixed. Add in the seasoning and stir till well combined. Add sea salt to taste. Serve with chilli padi hot sauce. 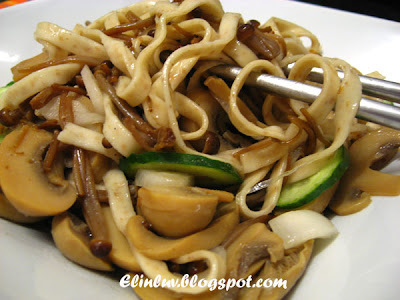 I wish that I can have this but I am allergy to Enoki. hey elin, last night i bought a packet of shimeji again but havent do it yet.. good idea, fry with noodles eh. 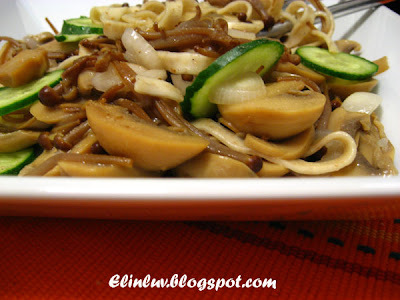 How I love a plate of that stir-fry noodles! Seems like you keep lots of different healthy noodles in stock! it looks delicious! I just bought some prganic noodles too. Theyre sitting in my larder waiting. Maybe tomorrow. heh. that stir fry looks so god m feeling hungry again. that's such a special, healthier noodles. It's the first time I heard of. Your noodles look very delicious. Love the mushrooms. This does look so savory and delicious. 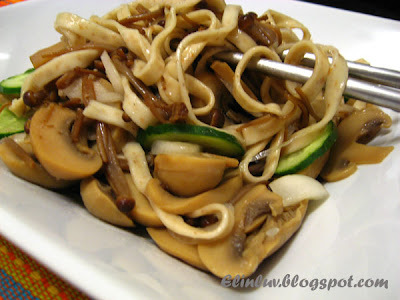 I don't think I've ever eaten enoki. 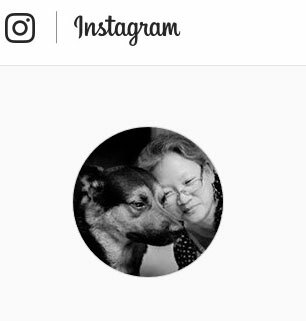 Must change that! That sure is a light meal, healthy and nutritious, good one! 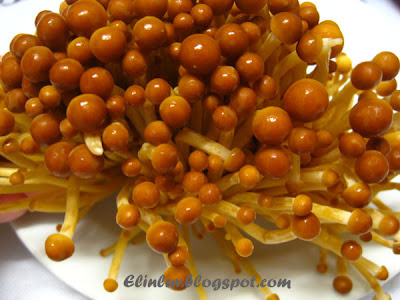 I have never had brown enoki -- ive only seen white ones. 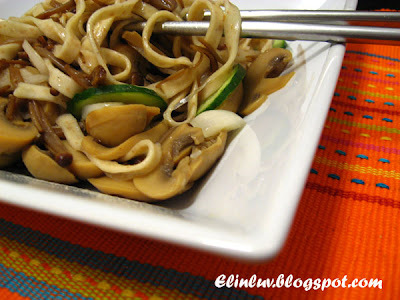 I love how healthy this dish is and I LOOVE mushrooms!! !